» Quiz for city folks: What’s this crop? Quiz for city folks: What’s this crop? This field of yellow spreads out north of Ryals Avenue on the way to Adair Village. We residents of the Willamette Valley are surrounded by picturesque countryside, but for most of us who don’t make a living in agriculture it would be a big help if the pictures had captions as well. I for one would appreciate labels or little signs telling me what’s growing in those fields. 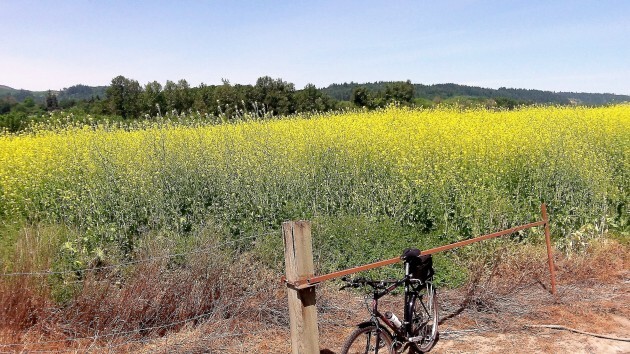 Riding my bike back from Adair Village last week, I pass this huge field of yellow blossoms. 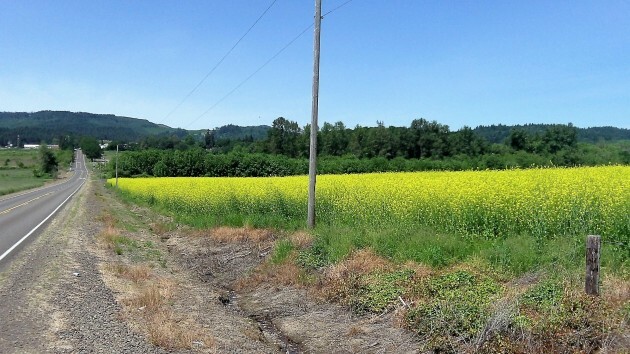 It reminds me of the controversy in 2013, when the legislature approved a six-year moratorium on the cultivation of canola in most of the Willamette Valley in order to protect other seed crops in the brassica or mustard family from cross-pollination. The legislation allowed some limited cultivation of canola for research. I’m wondering if this field is research canola or something else. Back home, Google shows me lots of canola fields that look like this. On Friday I call the Oregon Department of Agriculture for more information. The man I need to talk to is away, but I’m advised to email him, which I do. Promptly I get a reply, from Dr. Helmuth Rogg, the department’s director of plant protection and conservation programs. He’s on his way back from a meeting in Salt Lake City, and he says he’ll respond to my request on the weekend. This, needless to say, is way more help than I have any right to expect from a top administrator in a state agency, especially on a Sunday. But it leads me to think the field on Ryals Avenue is mustard. And I’m grateful that I learned a few things, including that the mustard family numbers more than 200 wild and cultivated species in the U.S and Canada alone, and that rapeseed, canola and mustard can’t be categorized as distinct species. Also, the term “rapeseed” probably comes from rapa, the Latin for turnip, and that canola is a combination of Canada, where it was developed, and oleum or oil. By common usage, canola has come to mean the edible types, while rapeseed refers to crops grown for industrial use. It was worth a stop to take a closer look. If you are an organic grower or specialty seed grower, OG or conventional, you have reason to think rapeseed is a good name. Coexistence is baloney. Turnips for seed. I cheated, I’m not a city folk.